These girls clambering over the rocks towards the rising sun look like sirens or banshees to me. The LWB says "All hope feeds the dawn, the promise of a fresh new day. As each challenge slows our chase of the sun, we can pause, reflect on how far we've come and move on feeling renewed. Or not." I'm not sure these people chasng the sun are my kind of people! There is something a bit nightmarish in this card. I am thinking of very career oriented people who are clawing their way upwards and not having fun at it. Now ain't that a thing! This is fascinating. I'm going to see if I can find some more "coincidences." LOL I´m looking forward to hearing about your findings. Yesa, I can see this. Regarding the influences, this is the one reason a book would be great. The LWB is perfect for everything else. 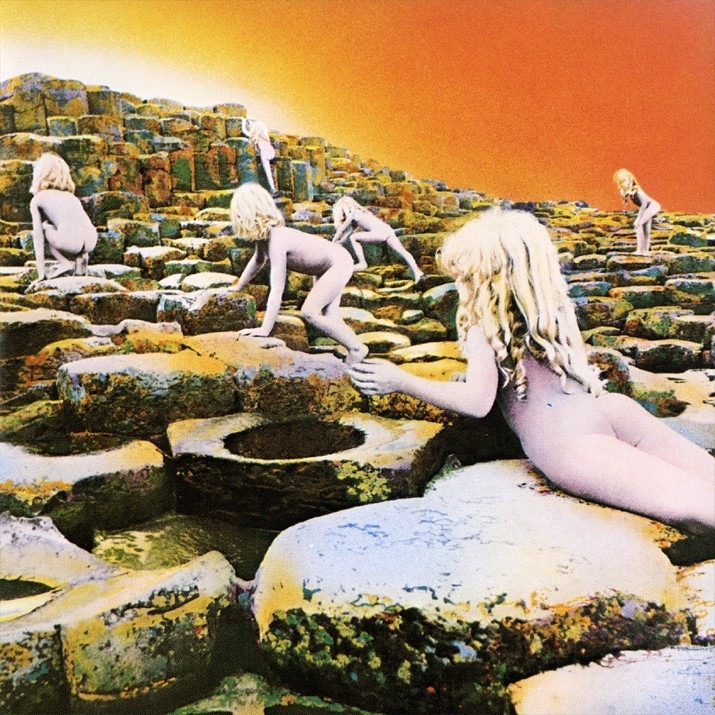 As a serious Led Zeppelin fan, I gotta say that I was shocked by the similarity of this card to the Houses of the Holy album cover. Now I have the song "Houses of the Holy" stuck in my head . . . except that song is actually on Physical Graffiti. Anyway, the album Houses of the Holy is my absolute favorite in the entire world, and "Over the Hills and Far Away" is my absolute favorite song in the entire world, from Houses of the Holy. Sorry, a little tangent there . . . but this is the 1st time one card totally sold me on a tarot deck . . . this is amazing! I LOVE IT!!!!! The LWB talks about the dawn, and chasing the sun, I hadn't thought about the 2 of wands that way, but I like it. I think that is a very good image for that idea. I see the people climbing the rocks, on their way to their goal. Will they make it? The deck has a lot of art references in it and we've only scratched the surface of finding them I think. As a serious Led Zeppelin fan, I gotta say that I was shocked by the similarity of this card to the Houses of the Holy album cover. I could have believed that it was a coincidence if it weren't for the fact that Hemera pointed out something that simply cannot be, that is the angel on the stretcher in 6 of Swords which must have been influenced by the Simberg painting. I have to say, though, that apart from the "coincidences" already reported, which is probably about half a dozen, I haven't found anything else.